Normally when it starts getting cold outside, in true rebel fashion, I keep rocking my usual garb. Yup, at college I was "that guy" who kept popping up around campus in shorts and tank tops like a beach bum in denial, even though it was mom-scolding-you-and-sending-you-inside-to-fetch-warm-clothes level temperature outside. I think I thought it would toughen me up. Maybe the Chicago boy in me thought he was bred to withstand the elements and would look like a badass for defying mother nature. It had to be athletic-professional enough to able to wear it while training my morning personal training clients. I wanted an outfit in which I could still enjoy my coffee shop laptop sessions without looking like a total gym douche (chuckling to myself as I think of all the odd looks I'd get walking into starbucks with nothing but my favorite leg day tights on my lower half). It had to be appropriate for spontaneous gym sessions, no matter what body group was on the menu for that day. Once I had my ideal winter uniform in mind, I set out to complete the look. The only things I needed that I didn't already have were a few more pairs of compression pants and a warm yet compact outer layer for my upper body. 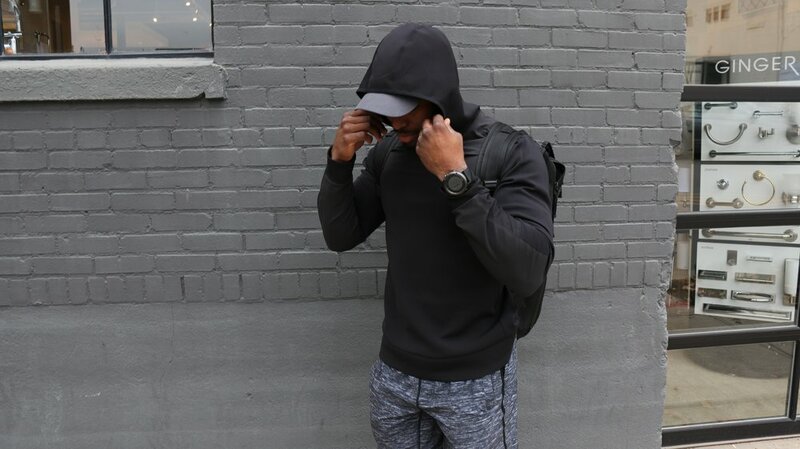 So I headed down the street to my friendly neighborhood Lululemon shop (my favorite is the Hill Center location in Green Hills, where I used to work as an educator) and bought one pair of Surge Tight DWR, a couple pairs of their Tight Stuff Tight and the License To Train Long Sleeve Hoodie. I've had it now for just a couple weeks, and I've already received compliments on the hoodie on more than five occasions. It feels warm and compact, like I'm wearing a more fashionable scuba suit top. I love that it has abrasion-resistant material on the forearms and upper chest, which allows me to hit lifts like front squats or push presses without worrying about fraying the fabric. It's obviously not warm enough that I'd wear it with nothing underneath, but if I throw on a tee and/or a long sleeve athletic shirt before it then I'm good to go. I already owned plenty of the Pace Breaker Shorts (which comprise 90% of my shorts wardrobe) and I happened to be wearing the Merrell Vapor Gloves because it was a leg day (the material is thin, which is perfect for a leg sesh but not so much for keeping your feet especially warm in the cold).